Standing up for the first time in front of other business owners or an audience can be an extremely daunting prospect. However, the following tips may help you to overcome that fear. Remember…It’s all about preparation! Start at a local business network meeting where there is a small group of people you know well. Rehearse in front of your work colleagues or friend. You can slowly increase your confidence and you will soon be speaking to larger audiences with confidence. Rather than doing a sales pitch, tell a story and make yourself memorable for the right reasons. If you share an interesting fact, your personal experiences or a useful piece of information, you are far more likely to be remembered, rather than simply stating who you are and what you do. Someone once suggested to me that if you imagine your audience in pyjamas that this will relax you! However you decide to imagine your audience, pick something that makes you feel comfortable and confident. Alternatively, have a few people you know in the audience and imagine it’s just a conversation between you. Smile and most importantly…..don’t forget to breathe. Pause, especially if you lose track of what you are saying. Ask questions, interact by carrying out polls, ask for volunteers and invite questions from your audience. When speaking, use your tone of voice, vary your pitch and don’t forget to share personal experiences. If you have a large audience it’s a good tactic to pick 3 faces (left, right and centre) and focus on them throughout your talk or presentation. That way you appear to be speaking to the whole audience. Avoid reading from pages of notes or using excessive content on Powerpoint slides, they should be used as a prompt only. Try to talk about things you know well and avoid heavy sales pitches. Share your knowledge and expertise, give examples and become a giver and sharer of information. The sales will soon follow. Be yourself. Trying to be someone else or someone you think you ought to be will lead you to stumble. Just be authentic to who you are and you will come across as genuine. People buy from people and your honesty and natural authenticity will shine through. Sandra Garlick is a business consultant and mentor and regularly speaks throughout the UK on various business growth topics. 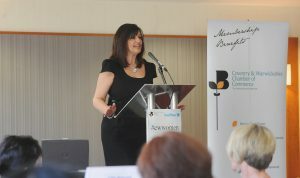 To enquire about Sandra speaking at your event, please call 024 7621 4440.